The third installment of the Fight Club-themed Street Fighter community events went down in a semi-seedy building next to the James Lick freeway in downtown San Francisco last Friday. Stations were set up for games journos, community members and industry insiders to go head to head in Street Fighter IV. The layout included six arcade machines and 26 PlayStation 3s. "We've been working really closely with Sony on [community events]," said Capcom PR rep Melody Pfeiffer. "So that's why there are no 360s here." The joke? Those arcade machines may have been running on a Windows platform. Melody wasn't sure. I got the chance to embarrass myself for about five minutes as Chun-Li, but the highlight of my night was counting up the Ryu-Ken fights. It’s not Street Fighter for me unless the great “love across the Pacific” story is played out in a three-round fight. Other popular pair-ups I spotted throughout the night were Akuma versus Crimson Viper (worst scream ever), Zangief versus Rufus and Cammy versus anybody. *That's not a hint to gamers. It's a reference to FIght Club (though you can't make out the carved Street Fighter logo in the picture). 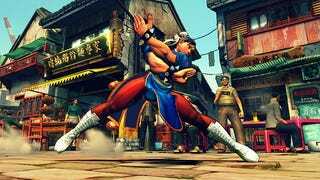 Street Fighter IV comes out in North America on PS3 and Xbox 360 Feb. 17. The PC version is due later this year.